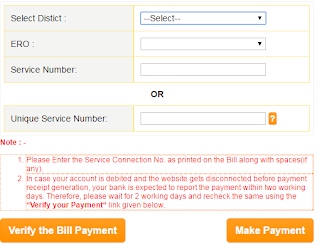 Telangana Electricity Bill Payment Online | How to Check Status and Pay? The Southern Power Distribution Company Limited of Telangana state or TSSPDCL is a Telangana State Electricity distributor company it is owned by Telangana Government. The Telangana Government is providing the different facilities to the consumers to pay the electricity bill those are Electronic spot billing as well as the Telangana Government tie-up e-Seva centers for electricity bill payment. 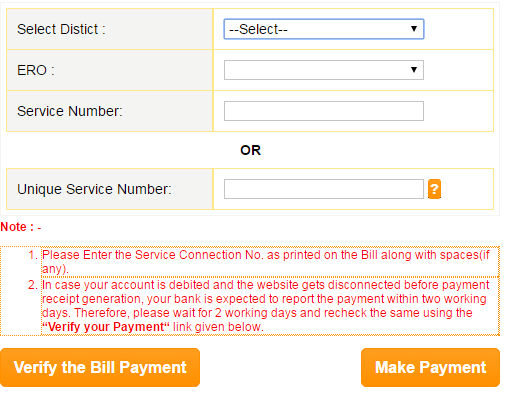 Are you looking for the online bill payment here we go step by step process for online electricity bill payment? 2.Click on online services or click on pay your bill. 3.Click on bill payment then you will get the three payment modes and you choose the one payment mode and go for next step. 4.Here we choose the Bill Desk mode. 5.The Select district,(ELECTRICITY REVENUE OFFICER)ERO and select service number or unique service number. 8.Fill the payment details and then click on Make Payment. 9.Click on confirm button. finally, your payment has done through online. Payment through Debit Card, Credit Card, Netbanking, and Wallet Cards, whatever you have the facility you can do payment through that facility.